A resolver’s speed is the number of electrical cycle pairs generated from the output windings compared to the number of mechanical revolutions. In a single speed resolver, a single electrical cycle is generated per mechanical revolution; in a multi-speed resolver, more than one electrical cycle is generated per mechanical revolution. Typically, the required resolver speed is determined by the application and degree of control required. Multi-speed resolvers provide multiple sine/cosine cycles per mechanical revolution providing higher accuracy. In the case of complex mechanical systems measuring small changes in velocity, tighter control is achieved with a multi-speed resolver but with cost tradeoffs. In the case of motor commutation, resolver speed will be determined by the number of poles. Showing Resolver WindingsA resolver consists of an input winding (primary winding on the rotor) that turns with the load and a pair of fixed output windings (secondary windings on the stator). The primary and secondary windings are wound with sinusoidally varying packing densities of the magnet wire. The secondary windings are positioned at a mechanical 90° offset to one another (see figure 1). They are known as the sine and cosine windings. During operation, current in the primary winding generates a magnetic field that induces voltages in the secondary windings. The ratio of these two secondary voltages can be processed to give the angle of rotation of the primary winding. Learn more about general resolver output. In a single-speed resolver, a complete voltage signal sine wave and a complete cosine wave are generated from the output windings. This means that a plot of output voltage as a function of angular position for the sine and cosine windings describes one complete sine wave or cosine wave, respectively, for every 360° of mechanical rotation of the primary winding and shaft. Single-speed resolvers are simple and economical. They are the most common type of resolver deployed in the field today. 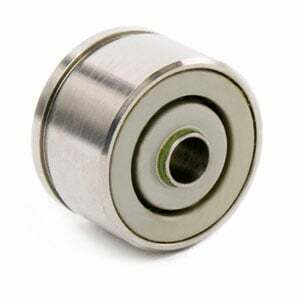 They are good fits for use with servo-motors, actuators, robotics, etc. 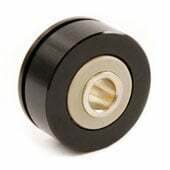 Because they only encompass 360° of electrical rotation for 360° of mechanical rotation, single-speed resolvers provide absolute position information and can be used as absolute encoders (along with an analog-to-digital converter). A multi-speed resolver has multiple turns for every 360° of mechanical rotation of the primary winding. 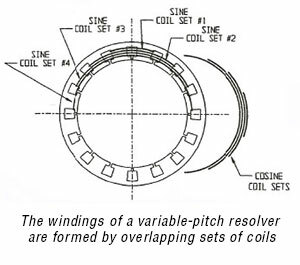 The historical method for building these types of resolvers was to monitor the additional turns mechanically using a gearbox mounted between the motor and the resolver. A more economical method is to monitor the additional turns electrically by modifying the windings. In a multi-speed resolver, the windings are wound to generate a higher number of electrical cycles. A three-speed resolver, for example, is wound to generate three complete sine waves and three complete cosine waves per mechanical rotation. The higher ratio of electrical cycles to mechanical rotation helps minimize the effects of mechanical error sources in the system. Although multi-speed resolvers are effective, the more complex winding pattern adds to cost. As a result, it should only be used if the performance improvement is required for the application. Position-measuring applications require single-speed resolvers. Recall that a single rotation of the shaft corresponds to one complete sine or cosine wave. As a result, any one mechanical position in 360° of rotation corresponds to just one unique value for the sine and cosine. That makes a single-speed design the resolver equivalent to an absolute encoder. Velocity applications use either multi-speed or single-speed resolvers. Some applications can work well with single-speed resolvers. Performance-sensitive applications need tighter velocity control, however. In injection molding, for example, excess velocity ripple creates knit lines or weld lines in the material, affecting not just the appearance but the quality of the product. In the case of escalators and elevators, velocity ripple introduces jerky movement that negatively affects passenger experience. Multi-speed resolvers deliver much smoother motion than single-speed designs for these types of applications. When properly specified, resolvers work well for motor commutation. In a motor application, a resolver’s speed is generally specified to compliment the number of motor poles. For example, a 5-speed resolver can be paired with a 10-pole motor. It’s also important to match the performance of the device with the requirements of the application. In most cases, commutation only requires about ± 1° of accuracy. Requiring feedback good to 10 arc minutes increases cost but with minimal performance improvement. If accuracy is required, Dynapar and Harowe offer up to +/- 2 arc minute accuracy resolvers. However, resolvers can only report on the performance of the system, they cannot improve upon sources of error. Consider a system with a motor, gearbox, resolver-to-digital converter, and coupling. The total accuracy of the system will be a summation of the errors of each component. Before the accuracy requirement of the resolver can be determined, it is necessary to know the system requirements and the accuracy contributions of the other components in the system. Simple, flexible, and robust, resolvers are good feedback solutions for harsh environments. Whether the application is steel production, nuclear power, or space travel, the right resolver can do the job. If you are looking for a custom resolver, please contact us and we will provide a solution tailored to your application. 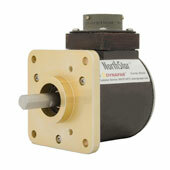 Flange mount housed resolver with 2.5" diameter, shaft seal standard, IP65 rated, 1 or 2 speed options, 3/8" shaft size. Size 21 brushless resolver offers high accuracy within 16 arcmin, low mass anodized aluminum housing, max bore size of 0.8"